Most of Greece was part of the Ottoman Empire from the 15th century until its declaration of independence in 1821, a historical period also known as Tourkokratia ( , "Turkish rule"). Ottoman advance into Greece was preceded by victory over the Serbs to its north. First the Ottomans won at 1371 on the Maritsa River — where the Serb forces were led by the King Vukasin Mrnjavcevic, the father of Marko Kraljevic and the co-ruler of the last emperor from the Serbian Nemanjic dynasty. This was followed by another Ottoman victory in the 1389 Battle of Kosovo. The economic situation of the majority of Greece deteriorated heavily during the Ottoman era of the country. Heavy burdens of taxation were placed on the Christian peasantry, and many Greeks were reduced to subsistence farming whereas during prior eras the region had been heavily urbanized. The exception to this rule was in Constantinople and the Ionian islands, where many Greeks lived in prosperity. Greeks heavily resented the declining economic situation in their country during the Turkish era. The Sultan regarded the Ecumenical Patriarch of the Greek Orthodox Church as the leader of all Orthodox, Greeks or not, within the empire. The Patriarch was accountable to the Sultan for the good behavior of the Orthodox population, and in exchange he was given wide powers over the Orthodox communities, including ethnic Greeks. The Patriarch controlled the courts and the schools, as well as the Church, throughout the Greek communities of the empire. This made Orthodox priests, together with the local magnates, the effective rulers of Greek villages. Some Greek towns, such as Athens and Rhodes , retained municipal self-government, while others were put under Ottoman governors. Some areas, such as the Mani Peninsula in the Peloponnese, and parts of Crete (Sfakia) and Epirus, remained virtually independent. During the frequent Turkish-Venetian Wars, the Greeks sided with the Venetians against the Ottomans with a few exemptions. The Orthodox Church assisted in the preservation of the Greek heritage, and during the 19th century, adherence to the Greek Orthodox faith became increasingly a mark of Greek nationality. Opposition of the Greek populace to taxing or paidomazoma resulted in grave consequences. For example, in 1705 an Ottoman official was sent from Naoussa in Macedonia to search and conscript new Janissaries and was killed by Greek rebels who resisted the burden of the devshirmeh. The rebels were subsequently beheaded and their severed heads were displayed in the city of Thessaloniki . The "tribute of children" was met with various reactions ranging from contempt to support. In some cases, it was greatly feared as Greek families would often have to relinquish their own sons who would convert and return later as their oppressors. In other cases, the families bribed the officers to ensure that their children got a better life as a government officer. The incorporation of Greece into the Ottoman Empire had other long-term consequences. Economic activity declined to a great extent (mainly because trade flowed towards cities like Thessaloniki , Smyrna , and Constantinople ), and the population declined, at least in the lowland areas (Ottoman censuses did not include many people in mountainous areas). Turks settled extensively in Thrace. After their expulsion from Spain in 1492, Sephardic Jews settled in Thessaloniki (known in this period as Salonica or Selanik), which became the main Jewish centre of the empire. The Greeks became inward-looking, with each region cut off from the others — only Muslims could ride a horse, which made travel difficult . Greek culture declined, and outside the Church few people were literate. The Greek language broke up into regional dialects, and absorbed large numbers of Turkish words. Greek music and other elements of Greek folk-culture were, to a great extent, influenced by Ottoman trends. After around the unsuccessful Ottoman siege of Vienna, in 1683, the Ottoman Empire entered a long decline both militarily against the Christian powers and internally, leading to an increase in corruption, repression and inefficiency. This provoked discontent which led to disorders and occasionally rebellions. As more areas drifted out of Ottoman control, the Ottomans resorted to military rule in parts of Greece. This only provoked further resistance. Moreover, it led to economic dislocation, as well as accelerated population decline. Another sign of decline was that Ottoman landholdings, previously fiefs held directly from the Sultan, became hereditary estates (chifliks), which could be sold or bequeathed to heirs. The new class of Ottoman landlords reduced the hitherto free Greek peasants to serfdom, leading to further poverty and depopulation in the plains. However, the overall Greek population in the plains was reinforced by the return of some Greeks from the mountains during the 17th century. Greek nationalism was also stimulated by agents of Catherine the Great, the Orthodox ruler of the Russian Empire , who hoped to acquire the lands of the declining Ottoman state, including Constantinople itself, by inciting a Christian rebellion against the Ottomans. However, during the Russian-Ottoman War which broke out in 1768, the Greeks did not rebel, disillusioning their Russian patrons. The Treaty of Kuchuk-Kainarji (1774) gave Russia the right to make "representations" to the Sultan in defence of his Orthodox subjects, and the Russians began to interfere regularly in the internal affairs of the Ottoman Empire. This, combined with the new ideas let loose by the French Revolution of 1789, began to reconnect the Greeks with the outside world and led to the development of an active nationalist movement. Greece was only peripherally involved in the Napoleonic Wars, but one episode had important consequences. When the French under Napoleon Bonaparte seized Venice in 1797, they also acquired the Ionian Islands . The islands were elevated to the status of a French dependency called the Septinsular Republic, which possessed local autonomy. This was the first time Greeks had governed themselves since the fall of Constantinople in 1453. Among those who held office in the islands was John Capodistria, destined to become independent Greece's first head of state. By the end of the Napoleonic Wars in 1815, Greece had re-emerged from its centuries of isolation. British and French writers and artists began to visit the country, and wealthy Europeans began to collect Greek antiquities. These "philhellene" were to play an important role in mobilizing support for Greek independence. A secret Greek nationalist organization called the "Friendly Society" or "Company of Friends" (Filiki Eteria) was formed in Odessa in 1814. The members of the organization planned a rebellion with the support of wealthy Greek exile communities in Britain and the United States . They also gained support from sympathizers in Western Europe, as well as covert assistance from Russia. The organization secured Capodistria, who became Russian Foreign Minister after leaving the Ionian Islands, as the leader of the planned revolt. On March 25 (now Greek Independence Day) 1821, the Orthodox Bishop Germanos of Patras proclaimed a national uprising. Simultaneous risings were planned across Greece, including in Macedonia, Crete , and Cyprus . With the initial advantage of surprise, aided by Ottoman inefficiency and Turks' fight against Ali Pasha of Tepelen, the Greeks succeeded in capturing the Peloponnese and some other areas. Some of the first Greek actions were taken against unarmed Ottoman settlements, with about 40% of Turkish and Albanian Muslim residents of the Peloponnese killed outright, and the rest fleeing the area or being deported. The atrocities that accompanied this expedition, together with sympathy aroused by the death of the poet and leading philhellene Lord Byron at Messolongi in 1824, eventually led the Western Powers to intervene. 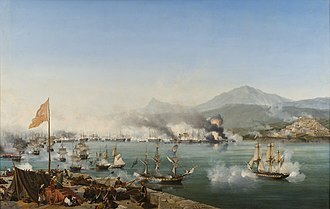 In October 1827, the British, French and Russian fleets, on the initiative of local commanders but with the tacit approval of their governments destroyed the Ottoman fleet at the Battle of Navarino . This was the decisive moment in the war of independence. In October 1828, the French landed troops in the Peloponnese to stop the Ottoman atrocities. Under their protection, the Greeks were able to regroup and form a new government. They then advanced to seize as much territory as possible, including Athens and Thebes , before the Western Powers imposed a ceasefire. A conference in London in March 1829 proposed an independent Greek state with a northern frontier running from Arta to Volos , and including only Euboia and the Cyclades among the islands. The Greeks were disappointed at these restricted frontiers, but were in no position to resist the will of Britain, France and Russia, who were largely responsible for Greek independence. By the Convention of May 11, 1832, Greece was finally recognized as a sovereign state. Capodistria, who had been Greece's unrecognized head of state since 1828, was assassinated in October 1831. To prevent further experiments in republican government, the Western Powers insisted that Greece be a monarchy, and the Bavarian Prince Otto, rather than someone with a Greek origin was chosen to be its first king. Treadgold, Warren. History of Byzantine State and Society. Stanford University Press, 1997. Vacalopoulos, p. 45. The Greeks never lost their desire to escape from the heavy hand of the Turks, bad government, the impressment of their children, the increasingly heavy taxation, and the sundry caprices of the conqueror. Indeed, anyone studying the last two centuries of Byzantine rule cannot help being struck by the propensity of the Greeks to flee misfortune. The routes they chiefly took were: first, to the predominantly Greek territories, which were either still free or Frankish-controlled (that is to say, the Venetian fortresses in the Despotate of Morea, as well as in the Aegean and Ionian Islands) or else to Italy and the West generally; second, to remote mountain districts in the interior where the conqueror's yoke was not yet felt. For example, during the Turkish reconquest of the Morea in 1715, local Greeks supplied the Turks and refused to join the Venetian army due to feared future reprisals by the Turks. (Stavrianos, L.S. The Balkans since 1453, p. 181). Vasdravellis, I. Οι Μακεδόνες κατά την Επανάστασιν του 1821 (The Macedonians during the Revolution of 1821), 3rd improved edition, Thessaloniki: Society of Macedonian Studies, 1967.